This weekend I had culinary holidays. Mr. No Onion Please disappeared in a cottage among woods with his friends and that meant only one for me – FREEDOM!!! 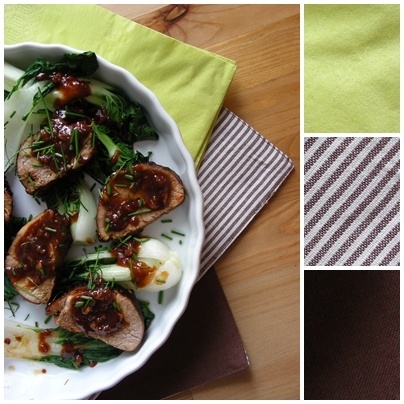 I could eat whatever I want, without murmurs and complaints – pancakes as a main dish of the day? Yes, please! But, but, but…. the centerpiece of my celebrations is here, a dish that revolves around 2 most hated ingredients of his, onions and mushrooms (on the other hand it also includes 2 of his favs – beer and bacon 😉 ). The autumn is inevitably approaching, and as much as my mood suffers from upcoming darkness, my belly wildly celebrates, as my favorite culinary season begins. There are still some berries and currants available, capsicums, eggplants and courgettes are at their best, first mushrooms appear and soon the pumpkins and my beloved root veggies will star in my dishes! The recipe for basic beer risotto comes from THIS book. I pimped it up with adding some pancetta, thyme and of course chanterelles!!! It is absolutely delicious, it’s such a pity that those great mushrooms are in season for such a short time 😦 The amounts make a generous portion for 2 people. Enjoy! 1. Heat up a tbsp of butter in a pot. Add garlic and onion and saute till golden in colour. Add the rice and mix until it becomes slightly transparent from the fat. 2. Add the cream and simmer slowly, stirring continuously. Once the cream is nearly absorbed add the beer and stir. Yes, risotto is all about stirring – the more you stir the better it is, because the more starch is released. Once the beer is nearly absorbed start to add the chicken stock in small amounts and stir. You will need around 500ml and 15-20 min till rice absorbs everything. So in the meanwhile you can make the mushrooms. 3. Melt a tbsp of butter in another pot. Add pancetta and cook till crispy. Add the mushrooms and thyme, saute for 3-4 min till the mushrooms soften yet stay tender. Add salt and pepper to taste. 4. Fish out the mushrooms and add to remaining sauce beer. Heat up till boiling and reduce the sauce. 5. Once your risotto looks ready add the thyme, cheese and 1/3 of the mushroom/pancetta mixture into it, stir for a minute or so. 6. 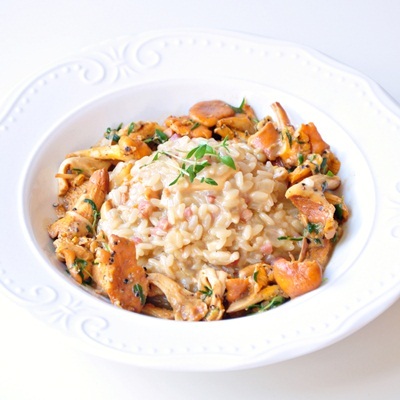 Serve risotto on a bed of mushrooms sprinkled with sauce. I guess you already know we love to travel. I wish I would also love to write about it and share the amazing places we’ve been with you, but I’m kind of lazy, and since I’m making thousands of pictures on holidays (yes you read that correct, I go into THOUSANDS and it annoys even me a lot 😉 ) it’s pretty difficult to choose what I would actually like to show you in a tiny space of a blog post. Fortunately, that’s not always the case. At the end of June we went for a long weekend to visit our friends in Luxembourg. 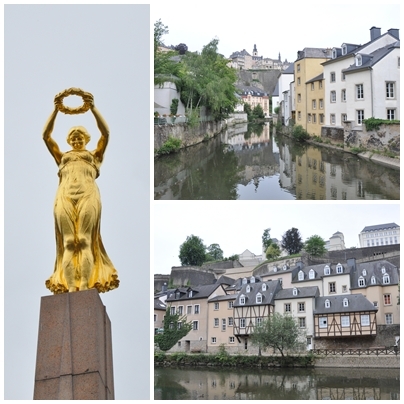 Short trip + lot’s of time spend on chatting = few photos 😉 Yes, finally manageable enough for me to finally write a post 😉 Luxembourg welcomed us with rain. Fortunately, we were unlucky with the weather just for a single day and enjoyed hot sunny days for the rest of our trip. I must say I was quite surprised how tiny yet international is the City of Luxembourg. It has only 80 000 of citizens yet it bursts with energy. 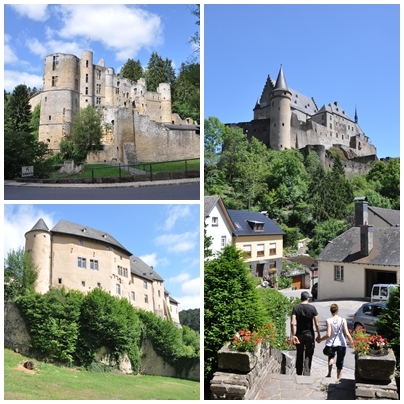 Somehow, I had an image of Luxembourg as a country that looks just like Netherlands, and I have never even thought that we will see charming villages hidden in the valleys surrounded by forests. I was really enchanted with tiny old towns full of cafeterias and craft shops – that’s the thing I really miss in Finland. 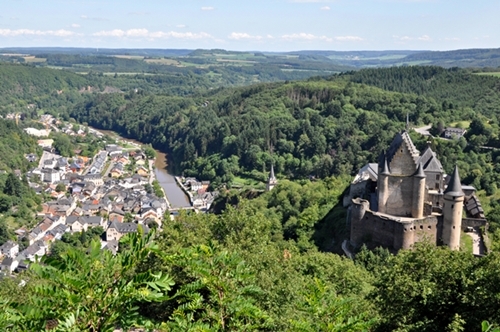 And another reason to visit Luxembourg are lovely vineyards spreading along picturesque Mosel river scenery, a true lifelong memory for me. I must say I’m really positively surprised how much this petite land has to offer! Sadly, I guess at the same time, it is the least traveled country among Benelux area. Luxembourg is a really tiny country. I guess it’s a bit difficult to talk about the traditional cuisine there as all the German, French and Belgian culinary influences pretty much mingle together. 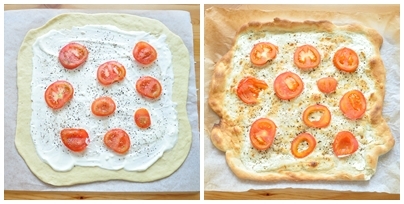 Thanks to our trip, I have fallen in love with a traditional dish from this region – the Flammkuchen, a kind of crispy peasant pizza that is topped with fresh cheese or cream instead of tomato sauce (it is also called tarte flambee on the French side). 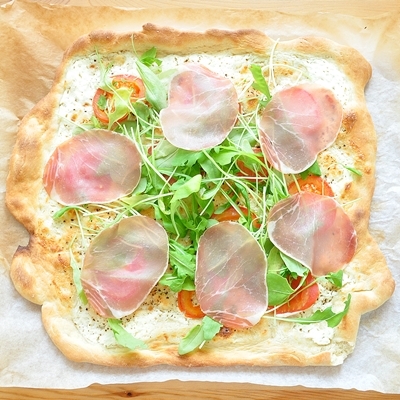 The traditional Flammkuchen is made with onion and bacon cubes, but since I have Mr. No Onion Please at home, I made a bit more modern and lighter version of it. From the amounts given below, you’ll get 2 Flammkuchen. The recipe for dough comes from Linda Collister’s and Anthony Blake’s “The bread book” and I found it on CinCin forum. The dough is absolutely fantastic! Comes out crispy and it’s so easy to work with – a must try! 1. Dissolve the yeasts in luke warm water and leave them aside for 5-10 min. 2. Combine flour, salt, yeasts and oil and knead a ball of dough. Let it rest under cover for 1,5-2h until it doubles it’s volume. 3. Hit the dough with the fist to release the air and divide it in half. Roll the dough very! thinly (I additionally stretch it in the air, to make it super thin), you should get 2 pieces roughly of the size of your baking tray. Today we’ve enjoyed a really great weather! Finally the spring has come. YEY! We had a long walk in the woods, some nice a bit lazy but still very good food and since we got up pretty early also looots of time just to hang around and relax. Ahhh I feel so energetic, the days are really long (15,5h at the moment – a definite reason to celebrate after winter’s darkness) and recently we also got quite much of cloudless days what additionally boosts me with energy. 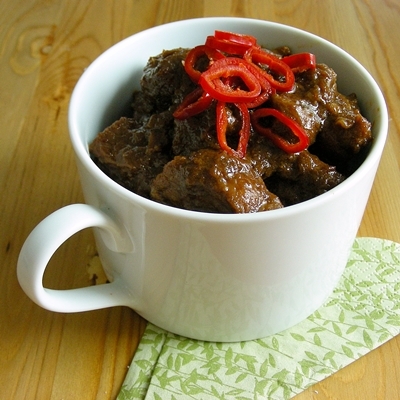 Anyway, time for the recipe 🙂 Today a very simple side – again Chinese and again from Ching-He Huang. The Szechuan cabbage was really good, though I’ve made a small mistake that reflected negatively on the final outcome. The recipe calls for pointed cabbage I’ve never seen it before and just guessed I’ll do fine with savoy cabbage. 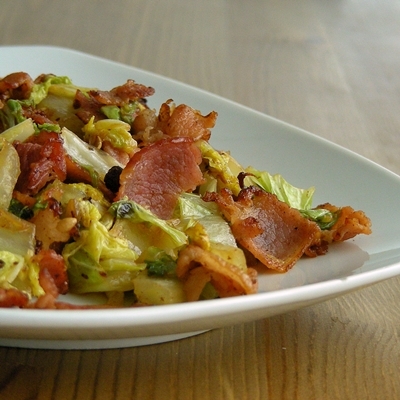 Unfortunately, the ends of the leaves in savoy cabbage are very delicate and upon frying they wilted. The white parts, however were deliciously crunchy. Next time definitely I’ll go for a cabbage with tougher leaves. 1. Heat wok, fry chilli and peppercorns for a while. Add bacon and fry for 2-3 min till browned. 2. Add rice wine and cabbage and stir-fry for 3 min. Season with vinegar, lemon juice and salt.